A month or so ago, I finally updated my desk setup. 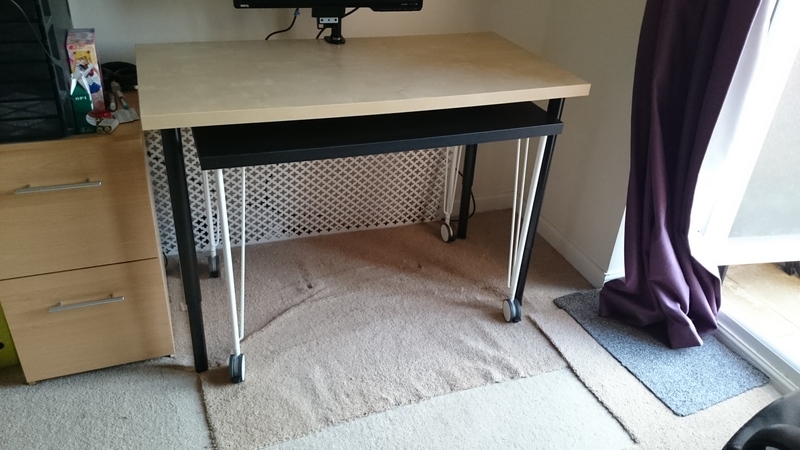 My existing setup used Ikea’s Table Top/Leg System – a Linnmon 120x60cm Top in Birch and two Lerberg Trestle Legs in White. This served me well for a few years – sitting in the living room, the clean look kept it from cluttering up the space and kept things light. It did well enough as a desk for my monitor and computer peripherals, but it just felt too small after a while. There was no space for a second monitor or my computer tablet, and it left no space whatsoever for other activities such as my various crafts – drawing, figure-painting, whatever else strikes my fancy. It just didn’t cut it anymore. Time to trade you in for a newer model! 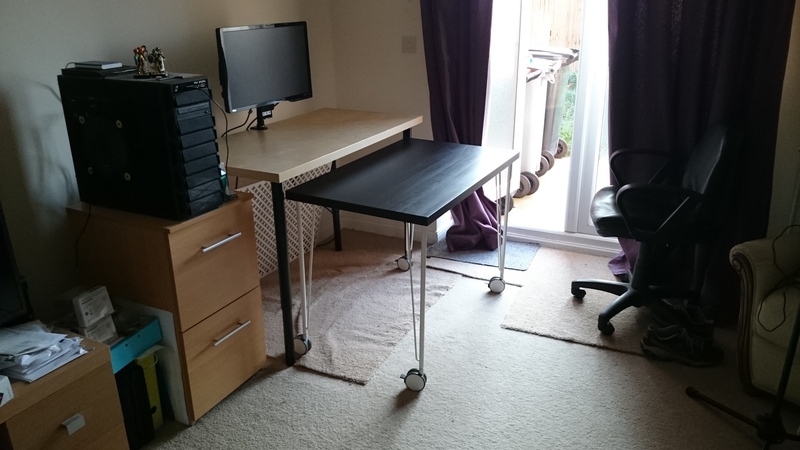 I looked at sourcing other desks, such as a long L-shaped corner desk, but they were too big and would need to support my hefty PC tower – a job presently occupied by a set of sturdy drawers and I don’t think any desk will support well. Inspired by this Ikea hack I found on Pinterest of a two-desk setup with one on caster legs, I knew that a desk on wheels would be perfect. For my space, I opted to have one desk slide under the other and stow when not needed. This meant that it took up no extra space when unused and could easily be pulled out when desired. 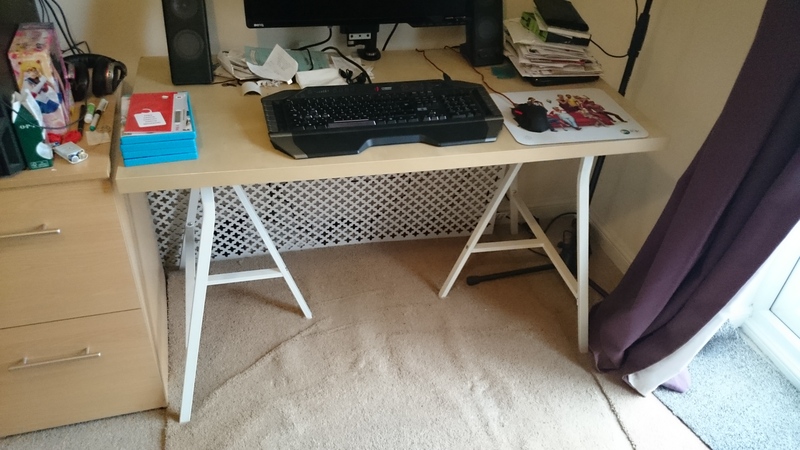 The Ikea legs are all a standard 70cm high, so this had to be the height for the shorter desk. For the taller desk, the only legs Ikea supplied that were taller were the height-adjustable ones. I was a bit dubious of using height-adjustable legs, but went for it anyway. 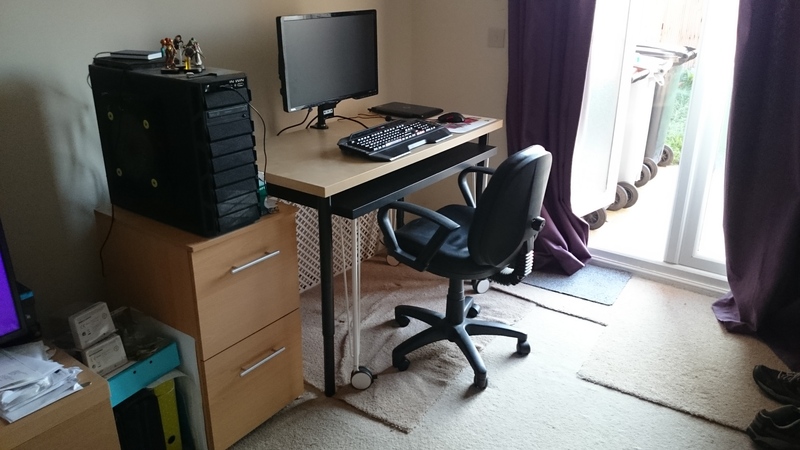 For the top, taller desk, I recycled the birch Linnmon Top of my existing setup – it is 120cm wide by 60cm deep. For the legs, I went for four of the black Olov Adjustable Legs. You can also get adjustable legs in chrome finish, but these cost more. For the smaller desk, Ikea only has the one set of legs with wheels, which are the Krille Legs with Casters and they only come in white. To balance the desk colours out, I went with the slightly-smaller Linnmon Top in black-brown, measuring at 100cm wide by 60cm deep. This gave it the same depth as the taller desk, but was narrow enough to fit between the Olov legs for stowage. Ta da! My masterpiece is complete! Overall, I’m really pleased with the new setup and have found loads of uses for it. I’ve used it for drawing at my desk, painting figures, wheeled it front of the TV while I do my nails, used it as a mobile desk for my laptop… It’s turned out to be way more convenient than I anticipated! It’s helpful that I can wheel it out just a little, all the way, move it to the side to make an L-desk, take it across the room, or just leave it completed stowed to under my PC. If anyone else is interested, there are a few points to keep in mind that I found as I went. 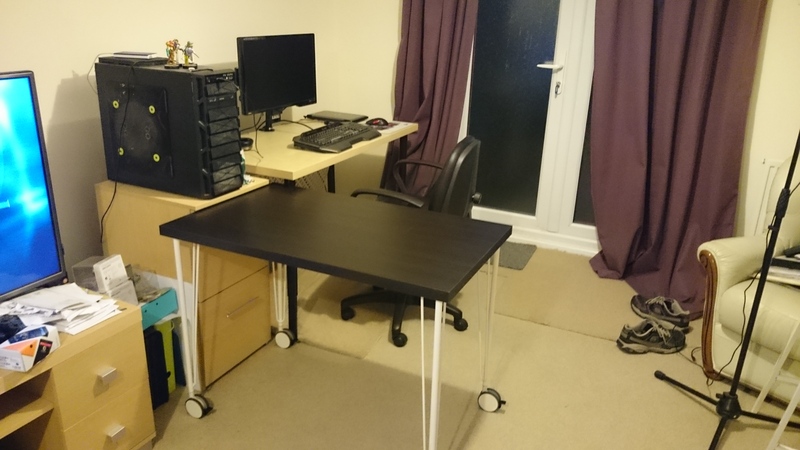 Firstly, if you are using this setup, the taller desk needs to be adjusted to at least 76cm in height in order for the bottom desk to fit underneath. The smaller desk’s legs plus table thickness put it at 73.4cm tall, so you’ll want at least that with a little more clearance for easy motion. If you go taller than 76cm, however, you start pushing the limits of what standard office chairs can go to at a safe and comfortable height for computer use, so keep this in mind. You can, theoretically, turn the taller desk into a stand-up desk and then use the smaller desk as a standard one when needed. It’s really up to you. I know that my desk chair is now at the highest point. Just make sure that your taller desk’s height is comfortable for your back and hands, as you’ll be using it the most. Another thing to keep in mind, but won’t affect everyone, is if you are using a monitor arm. If your monitor arm is desk-mounted like mine, then you will have a clamp bracket on the underside of the desk. This will take up some space, which means that my smaller desk doesn’t slide all the way back and the front isn’t flush to the taller desk. You can see this is the pictures. This is negligible for me and I tend to use this extra overlap to wrest my arm on, but it may not be for everyone’s taste and comfort. So, how much did this little project put me back? Well, I’ve got the maths for you right here. That’s right! 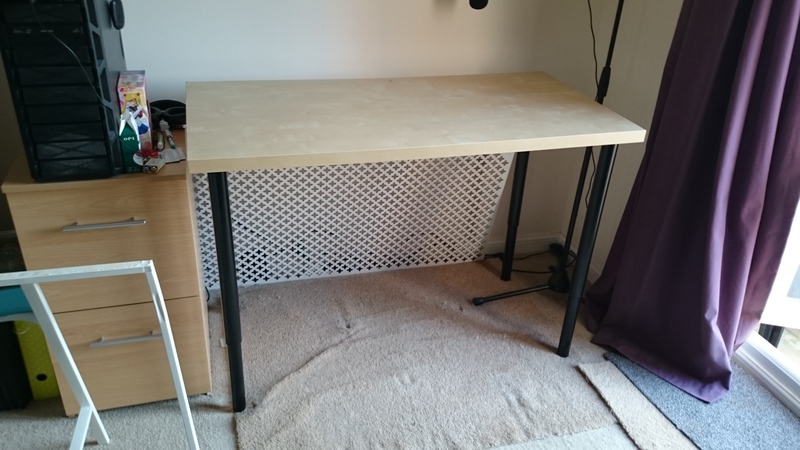 Two desks for under £100! There are more things you could do with these when you get them, but I’ve left them vanilla. For my purposes, leaving them plain is best, as the bottom desk will probably get trashed with various things like paint, glue, marker, etc. There’s no point making it pretty when it’s going to get wrecked!